Internet Video Metrics: When A View Is A View? What Counts As An Online Video View? When does watching a video online count as a "video view"? If your video counter on YouTube or Blip.tv says 5,000 views, what does that really mean? Have 5,000 people really watched your video from beginning to end or are these just those that clicked play, no matter how long they remained to watch after that? Internet video metrics are ways to measure and report when a video view is considered such. And since there are no pre-established rules in this arena, most every video sharing site takes a different approach to calculate video views. In fact the most interesting thing one can do is to look at all the different ways that such metrics are measured today to understand better the online video marketing and distribution panorama. And this is what Mark Roblat of TubeMogul, a company devoted to provide detailed analysis and reporting of online video views across all major video sharing sites, has in fact done. Nonetheless this market is in continuous flux and changes happen continuously, this research work conducted in mid-2007 provides great insight to those entering the online video distribution arena and wanting to understand more and better what the "numbers" really mean. This report discusses the findings of an experiment designed to test which actions result in a "view" as measured on eight online video websites. The impetus for this research was to identify the differences in view counting among popular video sites - particularly as the online video industry has not yet adopted a standard definition for a view. The implications are relevant for video advertisers, content publishers, and those that might seek to artificially inflate the popularity of a given video. 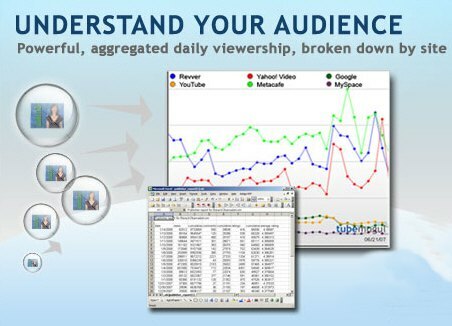 TubeMogul is an online video analytics company serving publishers large and small who need independent information about video performance on the Web's top video sharing sites. TubeMogul's analytic technology aggregates video-viewing data from multiple sources to give publishers improved understanding of when, where and how often videos are watched, track and compare what's hot and what's not, measure the impact of marketing campaigns, gather competitive intelligence, and share the data with colleagues or friends. The methodology employed in this study is a starting point and by no means an exhaustive list of testable scenarios. All tests were run from a single computer between 6/5/07 and 6/12/07, and each website tested had approximately 100 plays. Metacafe* One/IP addr. One/IP addr. One/IP addr. One/IP addr. One/IP addr. * Metacafe does not provide a "Private" setting for videos, so there was no control over views counted for the test. Google Video - Video was marked "Unlisted" to prevent others from viewing it through a search on the website (testing was performed in both "Unlisted" and "Live" modes). A video play resulted in views counted only when it was for more than half the length of the video. Google Video does not count views that result from an embedded video. Metacafe - Metacafe does not provide a "Private" setting for videos, so there was no control over views counted for the test. Attempts were made with different videos, but all garnered over 50 outside views in the first day. Metacafe informed us that they count a view if 50% of the video was viewed or at least 30 seconds. However, from our testing, it appears that even multiple full-length views are not counted in full. Communications with admins at the site revealed that views are tracked by IP address, so perhaps even full views in multiple are not actually counted from a single computer. MetaCafe counts a single view that originates from embedded videos. It appears that if multiple views come from the same IP address, just the first is recorded. Myspace - Video was marked "Private" to prevent others from viewing it through a search on the website. All tested categories resulted in views counted except when the video was stopped less than halfway through. Refreshes may have counted because it took approximately half of the video for the page to reload. Myspace counts all views that originate from embedded videos. Revver - Video was marked "Online" during testing and "Offline" in between testing sessions to prevent others from viewing it through a search on the website. All tested categories resulted in views counted. However, it is important to note that Revver switched their methodology for counting a view in March, whereas previously they had been one of the more stringent in counting views. At that time, the site switched from a view being a completed play to being an initiated play. Revver still captures "completions" in the API data, though completions aren't published publicly. They are the only site in the study that has completions in their API, and this information reflects that the advertisement was viewed. Revver counts views that result from embedded videos. Yahoo! Video - Yahoo! does not provide a "Private" setting for videos, so there was no control over views counted for the test. However, there was little to no outside influence on the view count. From testing, it was determined that even multiple full-length views are not counted in-full. The refresh test showed the counter going up, but then the system corrected itself and the counter went back down. Yahoo! Video does not count views that result from embedded videos. YouTube - Video was marked "Private" to prevent others from viewing it through a search on the website. Only multiple full-length views count in-full from a single IP address. Multiple embed plays counted as one view. YouTube counts a single view that originates from embedded videos. If multiple views come from the same IP address, just the first is recorded. AOL Uncut - Video was marked "Private" to prevent others from viewing it through a search on the website. All tested categories resulted in views counted. Views that originate from embedded views are counted. Dailymotion - Video was marked "Private" to prevent others from viewing it through a search on the website. No views were logged from refreshing the browser after play had started or from embedding the video on another site. DailyMotion does not record views that result from embedded videos. The top online video websites differ greatly in how they record video views. This lack of standardization presents complexity to content producers and advertisers in understanding the relative popularity of videos across video sites. To fully realize the potential of advertising models in the online video medium, increased standardization and transparency is required.